Are We Doing Our Best to Serve Youth? Despite mandates to be community-focused, many historical organizations struggle to interest younger visitors. Family programming is a great outreach method to include small children, but as kids grow, hanging out with their peers usually becomes a stronger draw for them than parent-guided activities. Many museums and historic sites currently support school groups by hosting field trips. 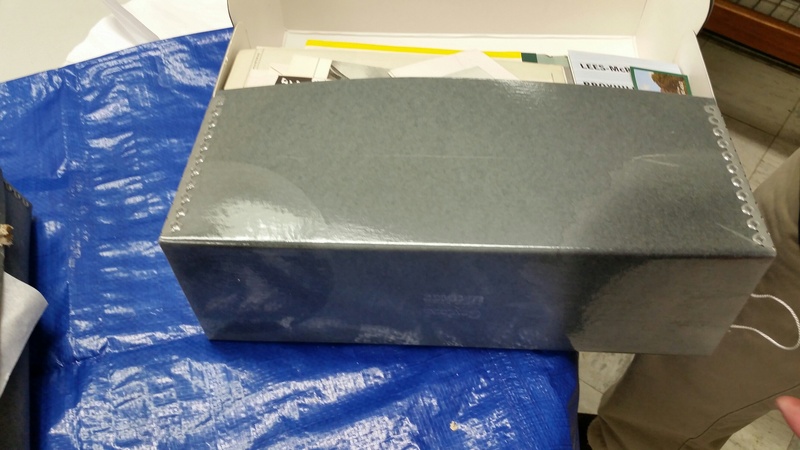 Some even offer history-in-a-box kits to augment curriculum and serve students, while allowing the school to avoid the inconvenience and expense of field-trip transport. Many also offer enrichment opportunities for home school families. While this audience is often more convenient for standard museum hours and staff schedules, it excludes many youth who may be interested or could benefit from historical resources. The NC Museum of History, for instance, has a selection of programs available each month for school-age children during the school day. In addition to home schoolers, tracked out students are the only possible participants. For the past 2 years NCDCR has been reaching out further to promote its facilities and services to the home school contingent by buying exhibit space at the annual home school conference in Winston Salem. NCDCR-organized programs such as Tar Heel Jr. Historians clubs and NC History Day have disproportionate numbers of home-school participants. The in-depth scholarly activities that these organizations nurture are often an easier fit for home-schoolers and may conflict with scheduling and test-preparation directives in standard public school classrooms. A California organization set up several “Community Science Workshop” spaces filled with interactives and set up as a drop-in free resource in a walkable location to kid-filled housing areas. 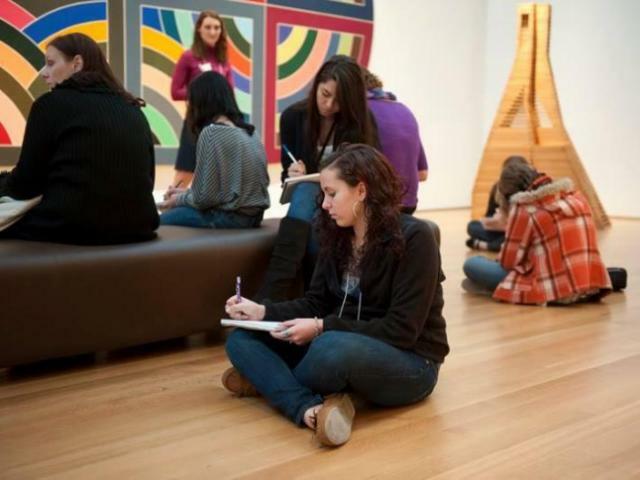 The Seattle Art Museum has used social media effectively to promote a regular teen night out successfully. Could either of these model programs work at your institution? What does your organization do to engage youth? Which activities and methods of promotion have been successful? What could be improved? Traditional textile mounts include stitching and pinning, which can stress the adjacent fibers disproportionately. Magnets act as more of a clamp and magnetic strips distribute the pressure evenly across a border or other strip. Magnets can be a safer mounting method for paper with very brittle edges than adhesive corners. This example shows magnet mounts around poster borders, leaving a thumbtack-like appearance without the collateral damage to the artifact. Pins can leave permanent holes in some materials—particularly skins. Magnets are less invasive in such cases. Conservators and exhibit designers across the country have come up with a variety of solutions for incorporating magnets into mounting systems. Find appropriate barrier layers to protect the textile or paper artifact from the magnets’ metal. Polyethylene filem (mylar) and Japanese paper are two safe possibilities. Magnets can be safely embedded inside archival museum board. In this example,the magnetic mounting system kept 3-dimensional artifacts mounted on panels for a traveling exhibit. Use a larger, strong magnet to remove magnets from the artifact in this case. Attempting to pry them away from brittle paper with fingers introduces more risk to the piece. Small rare earth magnets and magnetic strips are affordable materials for mount construction. 100 thumbtack-size rare earth magnets are available for $6.85 here. This option for magnetic strips is $12 for a ½” width and 7 feet length. 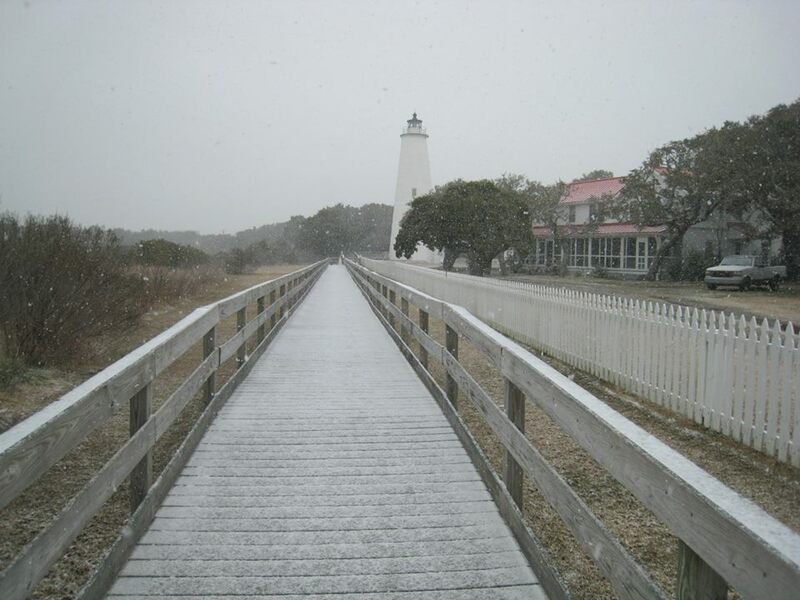 Thanks to Dale Pennington, Executive Director of Körner’s Folly, for this guest post. Preservation vs. access is a tricky balance that we all have to deal with in the museum field . In “The Anarchist Guide to Historic House Museums,” Vagnone and Ryan continually assert that visitors really want a tactile and authentic experience while touring house museums. But just because visitors want to touch, should we let them? And to what degree? The 22-room Victorian house was built in 1880 by Jule Körner, a local artist, interior designer, and furniture designer. After Jule and his wife died, the family removed all heirlooms and personal artifacts, boarded up the doors and windows, and the house sat largely untouched, aside from occasional vandals, until the 1970s. In 1971, the Town of Kernersville wanted to have the house demolished as it was rapidly falling into disrepair. Fortunately, a group of town residents came together and purchased Korner’s Folly. Their goal was to eventually restore Körner’s Folly and open it for tours. They operated as an all-volunteer run organization for nearly three decades, hiring their first professional staff in 1999. 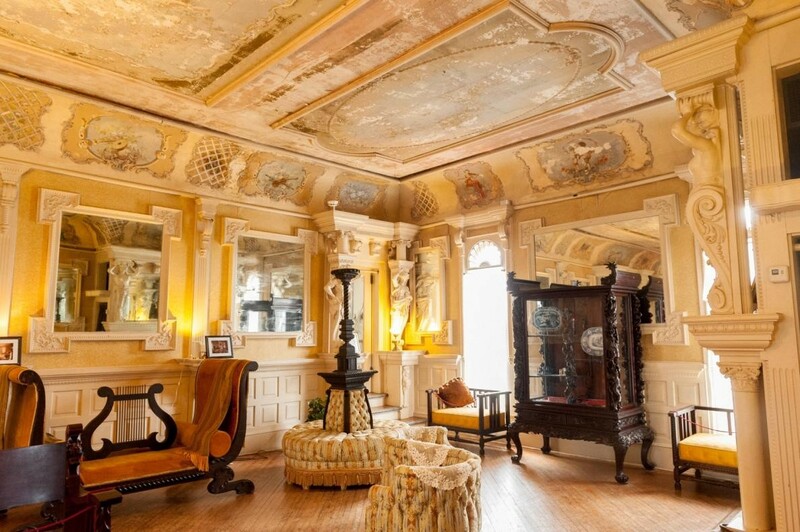 Most of original furniture remained in Korner’s Folly because it was too large to move; much of it was literally built in the room it still inhabits to this day. While many pieces of original furniture remained, there were virtually no surviving small artifacts, valuables, or heirlooms. 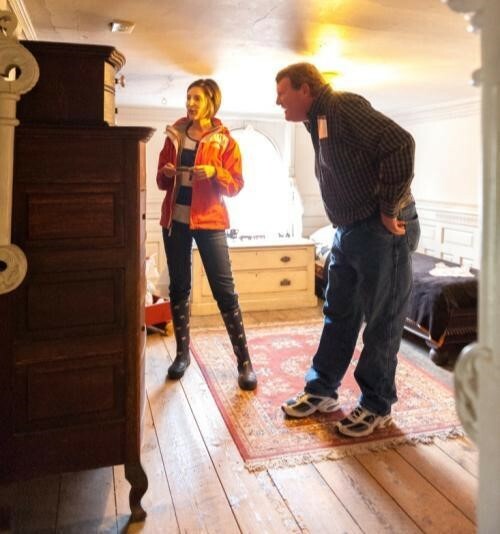 With a lack of “pocketable” artifacts, an unrestored house, and surviving largely on volunteers, Körner’s Folly was set-up for self-guided tours, with an orientation by a docent, and then a few velvet ropes and signs here and there to help visitors navigate. Today, while we have grown in staff size, we still largely offer self-guided tours. We have added a security camera system, “do not touch signs,” and more interpretive signs, but by-and-large, what grew of out of lack of resources is now an active choice our institution makes, guided by visitor feedback. I have always been really interested in interactive exhibit elements and ways of making audiences more engaged. So we are brainstorming ways to make the self-guided experience more interesting. For example, last year we created a scavenger hunt for children to do as they toured the house. The scavenger hunt is so basic and cost us nothing, and we always get lots of compliments on it (it’s rated 4.7 out of 5). Coming up for next year, we are experimenting with “Please Touch” baskets for a few rooms in the house. These interactive baskets will include (reproduction) items for touch or activities that visitors are encouraged to do. Challenging the lines between preservation vs. access is not a new concept. Ryan and Vagnone just suggest some different approaches, some that we are already implementing in my institution and some that would not work here. While I like creative ways of engaging visitors, I still can’t grapple with encouraging visitors to outright touch artifacts or sit on the original furniture. But I do appreciate Ryan and Vagnone’s out-of-the-box thinking. What works here would not work at every institution – we all have our own unique circumstances and limitations. I think what’s important about “The Anarchist Guide to Historic House Museums” is that it challenges us to imagine and test new ideas to enhance access, while continuing to preserve responsibly. With February’s onslaught of winter weather, another of our cultural heritage institutions needed help from CREST. A pipe burst in the Lees-McCrae College Library in Banner Elk on Friday night, February 20th. A member of the facilities staff called the library director Saturday upon discovery and reported the leak and damaged ceiling tiles. 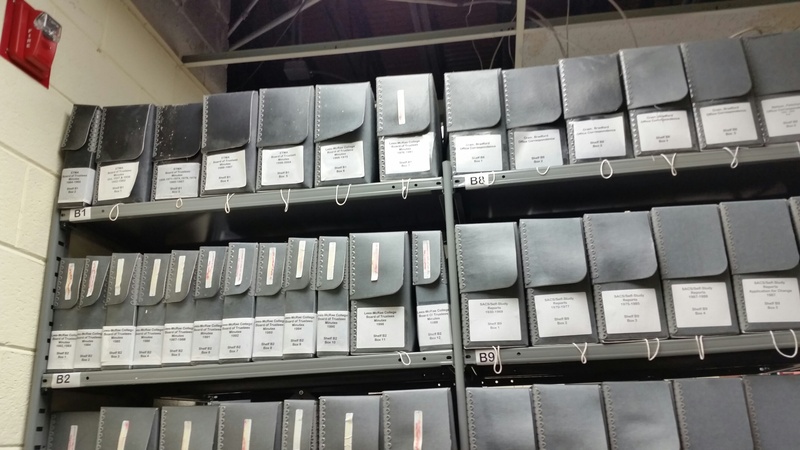 When librarians arrived Sunday (2/22), they found that the entire archives, containing “all the College’s history” along with additional materials of regional significance, had been soaking for 48 +- hours. CREST members Jeff Futch, Supervisor of NCDCR’s Western Office, and Heather South, Western Regional Archivist, responded to the CREST activation the following day and braved snow-covered roads to spend the next two days assisting with recovery. Initial delays in beginning the air-drying process and inside temperatures well over 70 degrees brought difficult challenges to the recovery effort. Air drying requires a great deal of space so that materials can be spread out and benefit from as much air flow as possible. By the time Futch, South, and library staff had secured a work area, photographs had already begun to stick together or to the envelopes and plastic sleeves that housed them. 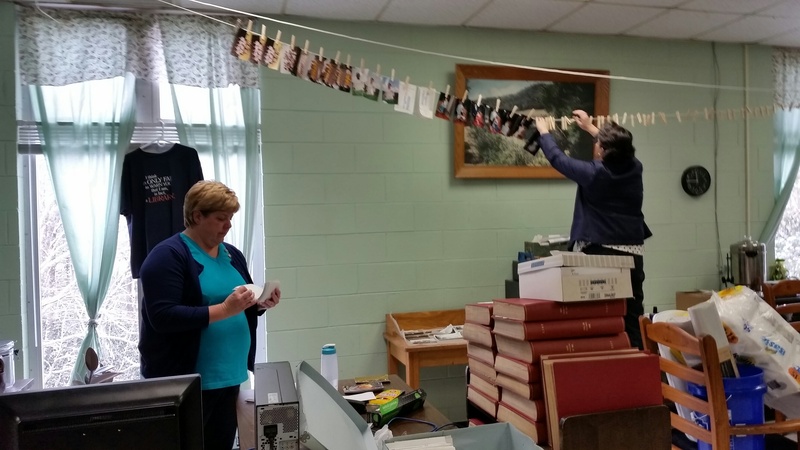 As with any disaster, there are always lessons to be learned and the burst pipe at Lees-McRae proved to be an unplanned test of the effectiveness of archival storage. One recovery advantage was that most archival materials had been well housed in boxes. These absorbed most of the moisture from the leak, leaving the artifacts inside mostly just damp and not sopping wet. Many of the boxes were the DuraCoat variety. DuraCoat is a thin layer of acrylic applied to the outside of archival boxes for moisture resistance. In the Lees-McRae case, wet conditions persisted over several days and the coating could not repel the volume of water. South noted that the coated boxes stayed wetter than the non-coated containers. Water was still able to seep into the boxes, and then the acrylic layer inhibited evaporation, keeping the paperboard and the boxes’ contents more moist. This disaster instance suggests that at nearly $2 more per box, DuraCoat is not a cost- effective product for more than a small leak. In cases where photographs called for simple air drying, Futch and South were able to string a drying line and pin photographs to it—a measure that economizes on surface space and maximizes air flow to each piece. 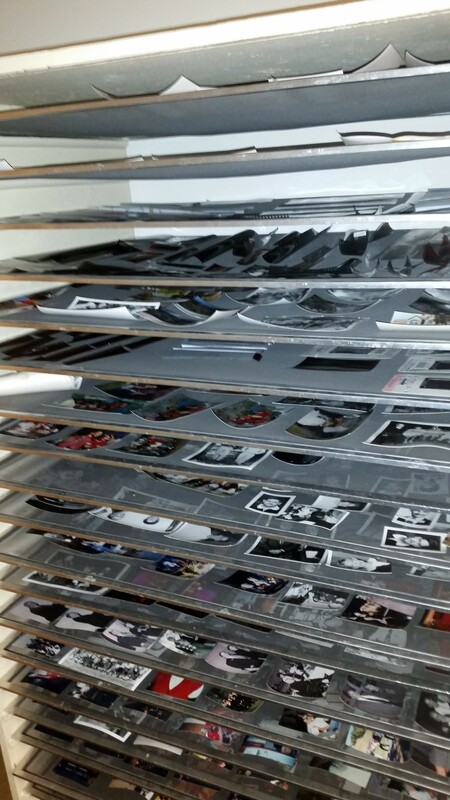 They set aside boxes with photos that had become more problematic and were able to bring them back to NCDCR’s Western Office for treatment. Somewhat counter-intuitively, wet recovery of damaged photographs often involves re-submersion in water. Because the photographic production process involves water, submersion in clean water for up to 48 hours is generally safe, when followed by thorough air drying. (Note that this is not appropriate for more recent digital prints.) 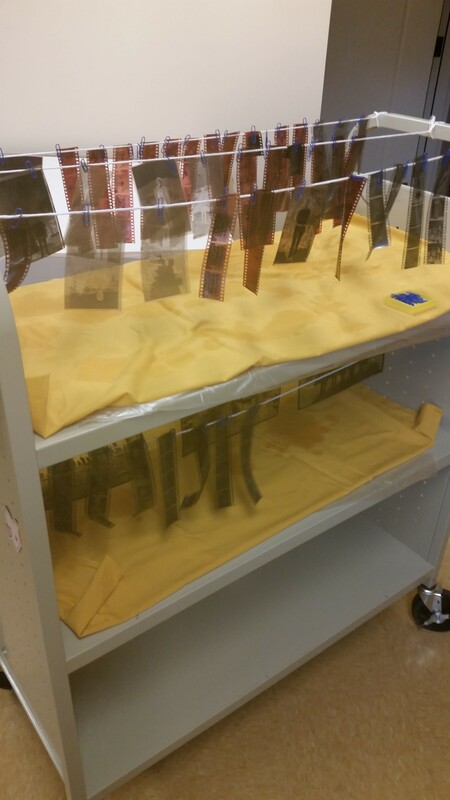 Careful wet treatment allowed Futch and South to remove deteriorated plastic negative casings from the image film. By the end of the week Western Office staff and volunteers had completed the photo recovery tasks. Thanks to these skilled and devoted CREST members for another CREST mission accomplished! For more information on wet recovery, click here for the National Park Service’s guidelines for photographs, books, and papers and here for Heritage Preservation’s video on wet salvage techniques. Although the bridges in North Carolina have been pretty icy and slippery in the past few weeks, the bridges that we are building through the C2C program and CREST are stronger than ever. This will only make our artifacts safer for future generations. I cannot stress how seriously important it is that your program – no matter how small or how big, is “on the radar” when a large scale catastrophic disaster hits our state. NCDCR now has a seat at the table of North Carolina Emergency Management (NCEM) during preparations before a large weather related event. We will be able to have access to better information for both response and recovery from the coast to the mountains. The very same thing is true if it is a local event and maybe just your site that is affected. For Example: Yancey County Public Library, Mendenhall Plantation, Charlotte Hawkins Brown Museum, and others have learned that preparations before an event will make a terrible situation more bearable. The overarching disaster management team (NCEM) must know of the distinct needs of cultural institutions. They need to know simply which institutions are in which counties and they need to know that, in partnership with Red Cross and other private disaster response groups, NCDCR will organize experts to help historic sites, museums and libraries recover and salvage artifacts. Over the last eighteen months the CREST project has built important bridges in numerous areas. Not only are many of our museums, libraries and historic sites better informed about mitigation and planning before disasters, but they are also better informed about what will happen after a disaster. CREST has proven over and over to be a necessary and viable program across the state. 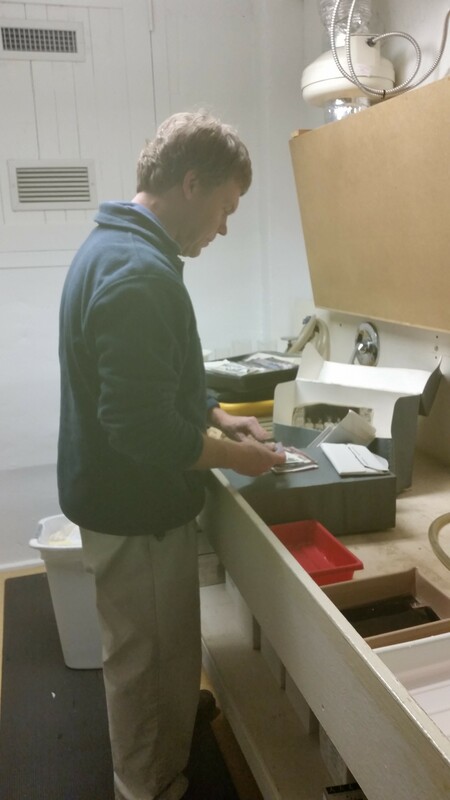 Besides the dollar value of books, documents, photos and artifacts that have been stabilized and kept from further deterioration, there is also the preservation of our local history for future generations of Tar Heels. The C2C team has been able to educate audiences about the importance of artifacts and their need for special attention before and after a disaster. This awareness has extended to community leaders, board members who support and develop our smaller institutions, and civic groups that volunteer to be of assistance. Moreover, we have encouraged larger cultural heritage institutions to re-examine their outdated plans and contact lists. This frequently leads to a re-thinking of critical needs and response sequences. Another important bridge of connections has been with North Carolina firefighters. They have learned about our work by collaborating on C2C’s 6 regional fire recovery workshops, and we have spread the word about their pre-planning process to our NC cultural heritage community. Across the state, museum and library professionals are connecting with their local emergency managers and fire & rescue personnel. This is very encouraging for NC Emergency Management professionals, as they are dedicated to the concept that disasters start local and end local. It is, in reality, the community that will respond to help in recovery and rebuilding. The better linked that we all are to local and state recovery officials, the more efficient recovery will be. So, stay off of those “icy bridges” that lead to a disaster. Contact us about how we can help you create an easy disaster plan and who your local connections are and how they can help you be better prepared when a disaster occurs.